Isolated thunderstorms early, then partly cloudy after midnight. Low 42F. Winds N at 15 to 25 mph. Chance of rain 30%..
Isolated thunderstorms early, then partly cloudy after midnight. Low 42F. Winds N at 15 to 25 mph. Chance of rain 30%. The Shen Yun performing arts orchestra is a tour de force that combines Western and Chinese musical instruments to create a unique whole. Currently it is the world’s only orchestra that embraces both Western and Chinese instruments as permanent members. The practice of deploying Western and Chinese instrumental timbre simultaneously in musical compositions is about 70 years old. Since the 1920s, the Chinese have trod many paths in exploring compositional styles and orchestration techniques to capture China’s rich traditions, both old and new, with musical sounds. A hybrid fruit of this effort is the modern Chinese orchestra, modeled after the Western orchestra. It is composed of different families of Chinese instruments — plucked-string, bowed-string, wind and percussion; each family being structured into soprano, alto, tenor and bass. Most of the instruments have been modified multiple times in order to achieve better intonation, brighter tone quality, and a wider range in pitch and dynamics. Yet the kind of instrumental combination offered by the Shen Yun performing arts orchestra, another fruit of this experiment, has never ceased to be in vogue. At the foundation of the Shen Yun performing arts orchestra are the four families of Western orchestral instruments — strings, woodwind, brass and percussion. This keeps the orchestra free from the intonation problems that incessantly haunt the modern Chinese orchestra in the performance of works created with Western harmonization principles. Although based on the Western foundation, the Shen Yun performing arts orchestra also incorporates Chinese instruments such as the two-string erhu and the plucked-string pipa. Each of these Chinese instruments is capable of invoking a wide range of imageries through different instrumental techniques and timbres. For example, the erhu can be extremely soulful with heart-touching melodies, its ability to glide from one register to another enabling it to imitate sounds ranging from birds chirping to horses neighing. The orchestra also takes advantage of the large pull of percussion instruments used in China’s regional music, seasoning its performance with unique instrumental flavor. The audience should look forward to hearing its recently expanded percussion section with ethnic instruments acquired from Xinjiang and other areas in China. The orchestra includes current and former members of major orchestras in the United States, China and Europe. Some members were previously persecuted in China, simply for being classical musicians or for following traditional spiritual practices such as Falun Gong. 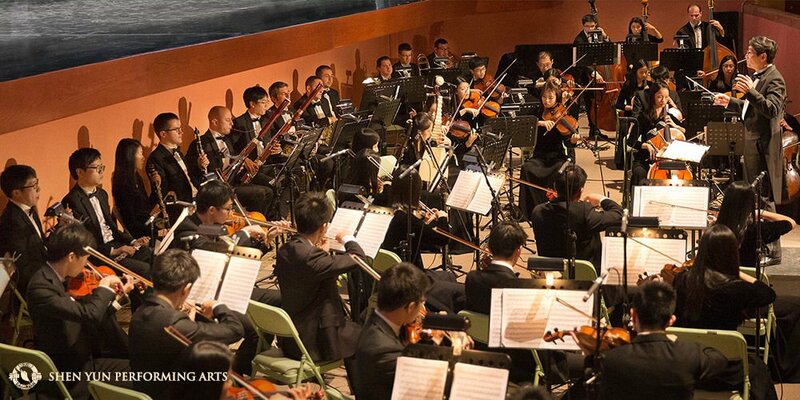 But despite of their diverse backgrounds, the members of the orchestra are brought together by their love of traditional Chinese arts and culture, which can be seen through the theatrical dances the orchestra accompanies. These focus on the values traditionally treasured by the Chinese people — compassion, honesty, loyalty and reverence for the divine. Creatively combining Western and Chinese instruments and being dedicated to rekindling traditional arts and culture have become the hallmark of the Shen Yun performing arts orchestra. With its artistically ambitious performances each year, the orchestra is pioneering a new direction in the world of performing arts. Shen Yun will be performing at Pikes Peak Center for the Performing Arts March 19 and 20. For more information and tickets, visit shenyun.com/cosprings.